This guide is intended for Senior District Webmasters. It covers the steps required to configure the templates in preparation for conversion to SLS2. Most of this work takes place in the Admin Center. You have choices when it comes to your homepage template. To help you with those choices, we have created an easy start guide for selecting a template. Make sure you have Senior Webmaster Rights. When you log into your account, you should see a link for the Admin Center in the Toolbox. If not, you need to have someone grant you rights or contact School Loop support for help. In this section, you will be working with Modules, so it is a good idea to review our Easy Start Guide for Working with Modules. 1. 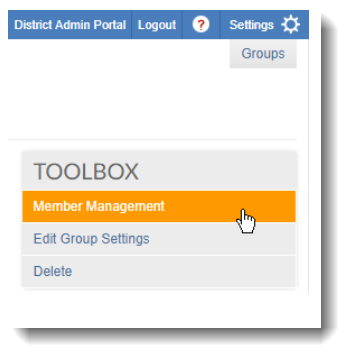 Follow the link to the Admin Center, click the tab for District Modules (1) and then click the Edit button (2). 2. Use the menu on the left side of the District Module page to edit the Bottom Wrapper, Emergency News, and Top Wrapper. 3. The wrappers brand all your school's sites and are displayed above the header and below the footer. Start by Clicking the option for the Top Wrapper (3) in the menu on the left of the page. Here you may edit the name of the district (4), the button label for the mega menu (5), and the links for your schools (6). Moving to the Bottom Wrapper (7), you can edit the district name and address (8) and the contact details (9). The only thing you might want to edit on the Emergency News module (10) is the title (11). By default, the title is "News Alert". You may change it as desired but for 508 accessibility, you should not remove the title. Lastly, click the Save & Exit button. The members of the Emergency New Group have rights to post news that will appear in the red News Alert Module. Typically, the members of this group are quite limited since alert news appears on every single site in the district. 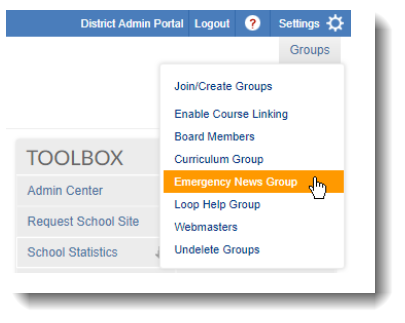 On your portal homepage, click the Groups menu and select the Emergency News Group. On the group homepage, click "Member Management" in the Toolbox on the right side of the page. From there, use the Toolbox links to Add members. Note that you can choose to add members with group admin rights, which allows them to also add members.